Once on board, you immediately will realize that captain and owner Hüseyin is not only looking after his boat the way it should be. He welcomes you in an atmosphere that you feel home once you step aboard. Just last winter he has totally refitted his boat with not only elegant interior woodwork, but also with enlarging her to a more spacious and more comfortable floating home. CEYDA 2 is a high standard Gulet and offers comfortable cabins, shaded aft, lounging area and plenty of deck space. 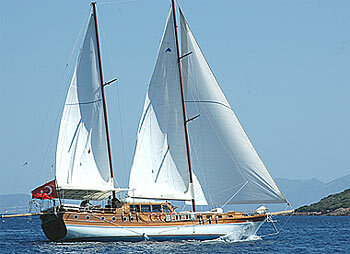 This Gulet is ideal for those who wish to combine comfort with the added pleasure of sailing. crew cabin, tender with outboard, canoe. For the adventurous sea lovers there are many activities to do during a sunny day. Fishing, windsurfing, diving, snorkelling and swimming. Also in many coves a guy with a waterski boat will come alongside, asking you if you would be interested in water-skiing. Provisioning: Full-Board including Breakfast, Lunch, 5 o`clock Tee or Coffee, Dinner will be provided for 32 Euro per Person / per day. Airport Transfer : Upon agreement. masks, flippers, canoe, sun awnings, sun mattresses, deck chairs, sea ladder, TV, music system, CD-Player. There is nearly none of the gullet charter-companies who tells you the truth about the use of air-conditition on Gulets. Yes, M/S CEYDA 2 has AC and you switch it on indivually. But on a boat the AC can only run when the generator is on, or in a harbor when connectet to 220 Volt. 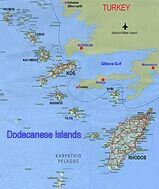 Mainly you are in anchorbays, often next to a neighbor, who doesn't like the noise of your generator and you wouldn't like it either during the night for example. So most of the gullets (like we), have come to a gentlemens agreement not to disturb eachother - AC can be used on the most of the boats 2-3 hours in the morning or at night from 20 to 24 hours to cool down your cabin.